Legendary Canadian thrashers RAZOR recently announced their first show in Montreal in over five years, at Foufounes Electriques on Friday, April 29th. Playing only a few shows a year they are also set to headline the 2011 True Thrash Festival in Osaka, Japan on February 11th, and the show in Montreal will be one the only shows they play in North America all year. 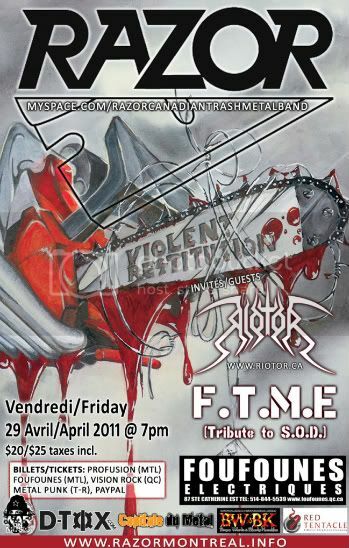 The show will also include support from RIOTOR as well as FTME, an S.O.D cover band. Tickets are available for purchase online here and in-store tickets will be available on February 18th, details for in store locations can be found here.